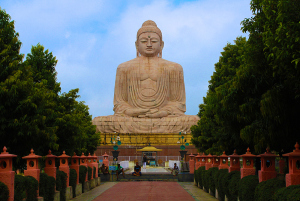 For more than a year, I have been trying to arrange a trip to Bodh Gaya in Bihar, India. I wanted to sit in the shade of The Bodhi Tree, the ancestor tree beneath which Siddhartha sat when he changed from an ordinary human to the enlightened Buddha. Every time it seemed the stars had aligned and the trip would happen circumstances conspired and the journey failed to materialize. Finally, in September 2014, I found myself sitting on a plane, the first leg of a three leg trip that found me in Bodh Gaya where I finally set eyes upon the Bodhi Tree.